A consumable iodine in its atomic form rather than its molecular form. An iodine atom that has an incomplete number of electrons. This means that the iodine atoms can hold an electromagnetic charge. 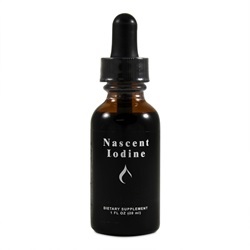 Nascent Iodine has a huge energy release when consumed. This “charged” state is held by the atom until diluted in water and consumed, whereby it gradually loses energy over a 2-3 hour time span. During this time, Nascent Iodine is recognized by the body as the same iodine that is produced by the thyroid and is absorbed effortlessly by the body. If using for additional energy and general improved health take up to 6 drops daily. Always take on an empty stomach. Add dosage to pure water. Take on an empty stomach 30 minutes before or 1 hour after meals, medications and/or supplements. It is recommended to take before breakfast, before lunch and then again before 4 PM.